Matt Niswander of Lawrenceburg didn’t grow up on a farm, but that didn’t stop him from pursuing his dream career in agriculture. Niswander married his wife, Colbie, when they were both 19. He graduated from college at 21 and wanted to start farming, but the high price of land made it nearly impossible. “It’s a struggle to be a first-generation farmer because the initial capital investment is so large,” he says. 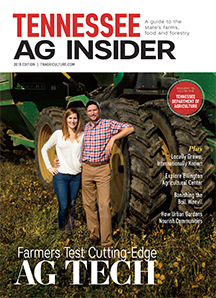 “Starting a farm from scratch takes hundred of thousands of dollars.” Niswander began working as a family nurse practitioner, while Colbie worked as a radiologic technologist. After several years of saving money and researching agriculture, the couple bought a farm in 2014. The couple installed fence posts and built barns on their property, and strung 30,000 feet of barbed wire. They bought two heifers and later a bull to breed them, and today they run a successful cow-calf operation with 30 to 40 head of cattle at a time. They sell their black Angus beef after processing direct to consumers by the quarter, half and whole cow. He continues to work full time off the farm and the couple plans to delve into agritourism in late 2018. Josey and Matt Miller of Lenoir City are also first-generation farmers. She used to work as a 4-H Extension agent with the University of Tennessee Extension, and now teaches agriculture at Lenoir City High School, while he works as an excavator. Niswander was selected as one of 10 people nationwide to participate in the Partners in Advocacy Leadership program, sponsored by the Farm Bureau, Farm Credit and Monsanto. As the farming population ages, Niswander says it’s critical for more young people to pursue careers in agriculture. Miller says it’s rewarding to see her students develop an understanding of agriculture. Good neighbors come together in the face of tragedy to help Bratton Farms in Shady Grove, Tennessee.